Brylee got her ear's pierced and she didn't even cry! She had begged us all Summer long to get it done. Of course I think she looks beautiful but she looks so grown up with them, it makes me sad. Nick and Mikka Adams! 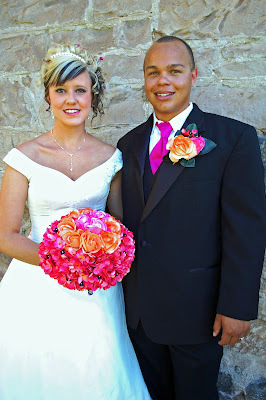 They were married on Saturday August 14th in Iona, Id. It was a beautiful ceremony and it was special to see how much they were in love. Oh how I love weddings! It was the happiest I remember ever seeing Mikka, and it meant so much. She was absolutely beautiful as always. She asked me to take pictures, and I was glad too. She's so easy to take pictures of. Here Carter's hamming it up on the dance floor. Not too long after this Mom fell on the dance floor...hilarious! It kept me laughing until I went to bed, I still chuckle to myself ever now and then about it. I know I have a weird sense of humor. Our big family...it is getting quite big actually! I love this picture, it shows my little boys in true form!!! Brylee reminds me so much of Mikka. From their toe head blond hair to their princess attitudes. And of course they are super close. Brylee loves her so much and misses her even more! All the girlies, we couldn't get any of the boys rounded up for a picture...of course. Brylee, Autumn and Addison did great at their first job as flower girls. We love you Nick and Mikka and wish you the very best! The last couple of months seemed to have flown by. It seems like we have been so busy. It's inevitable that Summer is coming to an end. And I can't decide weather to be excited for kids to be in school and be back on a schedule again or to be sad that my carefree Summer will too soon be gone. Anyway I'm gonna enjoy the last couple of weeks while they last! Yesterday Logan was supposed to have a race at the mini motocross track in Morgan. But on the practice race he over shot the double on a triple hill jump and crashed his bike into the third hill. It threw him into the handle bars and broke his clavicle bone (AKA collar bone) he also has a somewhat black eye, bruised ribs and a banged up leg. It could of been sooo much worse, I'm just thankful it wasn't and that he had his chest protector on, because he said it really knocked the wind out of him. Here's the break, it really grosses me out. And I can't even begin to understand how it's supposed to heal straight, but I guess I'm supposed to trust the doctors. He has an appointment next week with an orthopedic dr. to see how it's healing and find out that at that point he'll need pins in it...let's hope not! Get better bud, we love you very much!